SPACE BAR on the beach of Gili Air, a tiny island between Bali and Lombok. Fly to Denpasar (Bali), take Bus to Padang Bai and the boat (Perama) to Gili Air, or fly to Mataram (Lombok), take a bus to Bangsal and small boat to Gili Air! 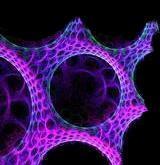 fluorescent decoration, stringart and lasershow by Psynoramix (Switzerland) videoanimation by Dizzy (France) Chilloutgarden with hammoks under the coconuttrees with the sound of waves and geckos! 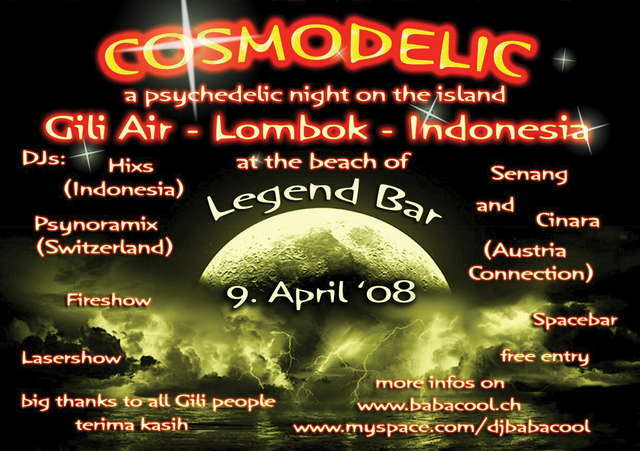 Name of the party: "Shakedelic"
Address (with City): Legend Bar, Gili Air, Lombok:on the beach of Gili Air, a tiny island between Bali and Lombok. Fly to Denpasar (Bali), take Bus to Padang Bai and the ferry (Perama) to Gili Air, or fly to Mataram (Lombok), take a bus to Bangsal and small boat to Gili Air! Since 4 years we are celebrating on this magic island psychedelic events. This time it will be a newyear party on the beach in a beautyfull enviroment with lots of fluorescent decorations and an international Line up! But Gili Air is not only a party location, it is the perfect place to spend your holiday or relax in a hazzlefree atmosphere from your travel! 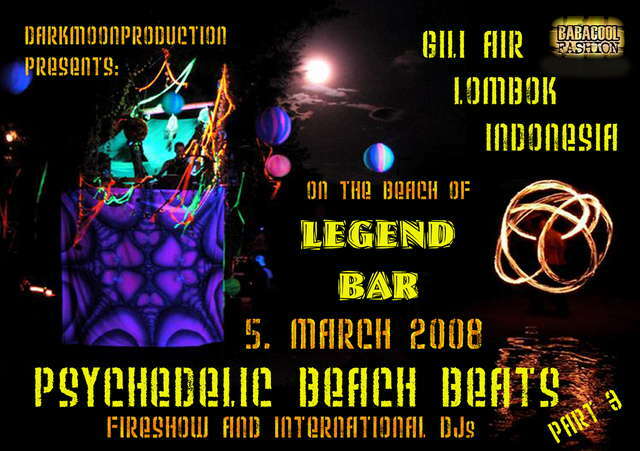 Address (with City): Location:Legend Bar, on the beach of Gili Air, a tiny island between Bali and Lombok. Fly to Denpasar (Bali), take Bus to Padang Bai and the ferry (Perama) to Gili Air, or fly to Mataram (Lombok), take a bus to Bangsal and small boat to Gili Air! Since 4 years we are celebrating on this magic island psychedelic events. It will be a little party on the beach in a beautyfull enviroment with lots of fluorescent decorations and an international Line up! But Gili Air is not only a party location, it is the perfect place to spend your holiday or relax in a hazzlefree atmosphere from your travel! on the beach of Gili Air, a tiny island between Bali and Lombok. Fly to Denpasar (Bali), take Bus to Padang Bai and the ferry (Perama) to Gili Air, or fly to Mataram (Lombok), take a bus to Bangsal and small boat to Gili Air! Since 4 years we are celebrating psychedelic events on this tiny natural island in Indonesia. It will be a little party on the beach in a beautyfull enviroment with lots of fluorescent decorations and an international Line up! This time we are proud to announce you the visit of Austrian Connection DJ Cinara and DJ Senang! But Gili Air is not only a party location, it is the perfect place to spend your holiday or relax in a hazzlefree atmosphere from your travel! Yodha (Switzerland) our fluorescent spiderman presents his lasershow! after two sucessfull psychedlic beach beats in 2007 we gonna celebrate another one this year! Since 4 years we are celebrating psychedelic events on this tiny natural island in Indonesia. It will be a little party on the beach in a beautyfull enviroment with lots of fluorescent decorations and an international Line up! But Gili Air is not only a party location, it is the perfect place to spend your holiday or relax in a hazzlefree atmosphere from your travel! for more informations about the location and party please contact us. 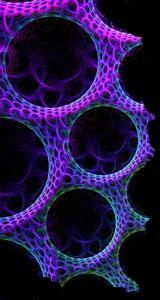 combination of our UV spiderman Yodha and traditional, natural decoration!